Cream sugar and oil. Add eggs, one at a time, beating well after each addition. Sift dry ingredients and gradually stir into egg mixture. Fold in carrot and nuts. Grease and flour three 9-inch layer pans. Divide batter into prepared pans and bake for 20 minutes at 375 degrees. Cool on cake racks. 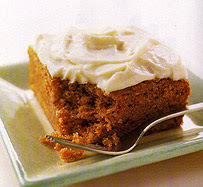 When cool, put layers together with crushed pineapple or alone and frost with cream cheese frosting. Combine all ingredients and mix to a frothy consistency.